A sizeable percentage British modellers, as many on here will no doubt be aware, seem strangely adverse to modern trains; particularly units. Sadly this attitude has extended to the main manufacturers, who lack the enlightened approach taken by their Japanese counterparts. The net result seems to be that some of our (i.e. the UK's) most stylish trains are not available as a ready to run model. What this means is that an alternative approach is required, by way of Kickstarter. A few months ago a project was set up to produce the class 390 Pendolino sets, operated by Virgin Trains along the West Coast Main Line between London and Scotland, in N Gauge. These will come in a number of guises, both in DC and DCC. If enough modellers back this project and it gets the go-ahead, then a full set will be available from £255, approx $400.00, (9 carriage version, DC) to £380.00, approx $600.00, (11 carriages, DCC). A recent development has confirmed Rapido will be the manufacturer. So, if anyone on here fancies an iconic train, for a very reasonable price, then take a look at the link below for more details. There are also more details and discussion on here. There's also a 5-car set. Also, the Kickstarter method is EU-only (see the FAQ, entry "EU vs Rest of the World"), people not resident there need to order directly with the manufacturer. Yeah, that is rather unusual isn't it? Was lucky that at least my own local trains from where I originate were pretty much universal in the UK (158) and have got to enjoy many fine examples of the class. No N scale ones though, that is a botch job in my opinion. Oh, and for anyone (like myself [*]) wondering what a Pendolino is, it's a tilting train of Italian origin with many variations, the British one of which is the Class 390. [*] I'd heard the name vaguely but as anything British post-privatisation is of little interest to me, the name didn't say much until I read about the project; checking my photographs of my UK trip it appears I saw a couple in Birmingham. The idea is great, but the project is not really tought through. The base price and the minimal amount (800+200 sets) is rather high. The idea to get 800 buyers in the EU and let the manufacturer sell 200 internationally really shows that even the manufacturer won't expect more than 200 sets to sell internationally and 80% of the production run has to be sold out before any preliminary design steps are taken. I think there is a market for a 200 set run, but selling 800+ sets with most of the british N scale modellers focused on steam, branchline diesel and/or British Rail is very optimistic. Personally i think that a cheaper production method, similar to Tomytec trains, together with a modular design (motors, lights, everything optional and bought off the shelf) would have made it easier to start the production and required less up front investment. Also a more common train, like the networker family (class 165, 166, 316, 457, 365, 465, 466) would sell better and could be made on the same modular mould, since only the roofs and fronts differ. Also they can be painted in a lot of liveries of at least 3 different epochs. The class 390 is a very beautiful train, but it's single opeator, single epoch and little modelled catenary electrified west coast mainline location makes it's potential market rather small. (i'm not even sure if there are 800 people in the EU who would buy one at the current price) Getting the features and the price way lower would have allowed it to be sold as a start set for kids at toy stores and that is a way larger market, so i'm sure over 1000 could have been sold. Trust me - a lot of thought has gone into this project! You make some valid points, but there are a few misconceptions. For injection moulding to be worthwhile you generally have to produce at least 1000 of anything otherwise the tooling costs make any project far too expensive - I don't for one minute think that Tomytec produce items in runs of 1000, I would expect several multiples of that figure. Sure you could produce a 200 set run but you would multiply the price by 4 or 5 times! Ben and I are well aware of the interests of the UK N gauge market (we are both heavily involved in product development for the N Gauge Society) and we are not so pessimistic about the interests of the market. The idea of going for Kickstarter was that it helps get modellers more involved in the development of the model and crucially it provides evidence to a manufacturer that a market exists. Price - we think it is very reasonable for a complete 9-coach train. When you consider that Arnold's Brighton Belle was £200 for 5-cars and the Farish Blue Pullman was £250+ for 6-cars. Why a Pendolino (and not something like a 317/319/321/455/456) - simple, it is an iconic high speed train. In this instance the fact it only has one livery (actually there are quite a few vinyled variations eg Superman, X Men, Alstom, Poppies etc) is an advantage as we don't have to worry about one livery selling better than others. The WCML covers a huge geographical spread of the UK plus Pendolinos were regularly dragged when not under the wires eg across the North Wales coast to Holyhead and over the Settle & Carlisle when engineering works were on the WCML, there have also been test runs on the East Coast. Nevertheless you are right that it will be a challenge to reach the orders necessary! We hope the fact that it is such an iconic train will encourage modellers to support the project in any way they can! Apologies one final point - the response so far has been incredible! We reached 20% of our funding target within 36 hours of the project going live and we have the UK's largest model railway show (at Warley NEC) this weekend. We were talking about it in the club here in Budapest, as I am really thinking about pledging one 9 car sets. Although it is quite expensive compared to my budget (and compared to the price of the Japanese trains), but I think if we (I mean people who are modelling modern British theme) support it it would result more models in the future, maybe based on community financing. It is not my modelling area (SW from London) and I have only traveled with it once, but would look great. I do not know how much member does the N Gauge Society have, when I joined a few years ago, I was almost the 18.000. So maybe there are around ten thousand at this moment, but I think red_death can correct me. And it is quite possible that there are 800 people (or 600 if there are some who pledged more than 1 train). I am very curious what will be the result after Warley. Please let us know, although I am reading the N Gauge Forum UK also. Thanks for the info Mike! I didn't know you were reading this forum. Your point about the price is right and we all hope this will be a successful project. Maybe i should read the UK forum too, so i could get news and information first hand. I have put in for a nine car DC set without sound, to keep the cost down, initially. Once I receive the order, hopefully, I will then look at other options. It should look good next to my two Bullet trains and I can't wait to see it running on Kato Viaduct track. It is going well so far, but there is still a long way to go! Just a little bump...there are only a couple more weeks left to go. With two and a half days left for pledging, the Kickstarter total is at £152,500. We're still £57,500 short, and would need pledges equivalent to £23,000 per day to reach the total. That's still possible, but while Mike, Jason and I are still fervently hoping that we will reach our Kickstarter target, with this in mind we would be foolish not to at least have a back-up plan ready. I am delighted to say that Jason and the team at Rapido have taken the decision that the £150K pledged so far is enough to justify this model being produced whether or not the Kickstarter campaign reaches the target. 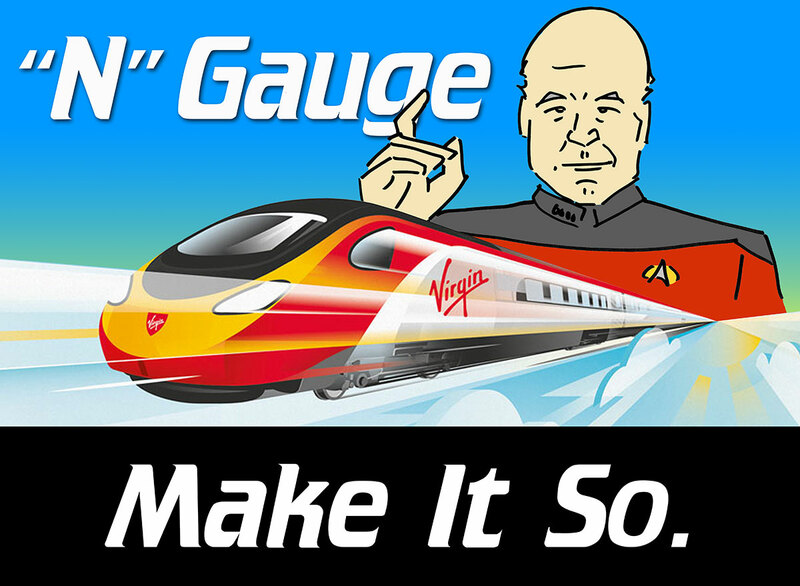 If you have pledged, please also register at our website www.ngaugependolino.com to ensure you can take advantage of the Plan B offer for pledgers. We are also very proud to say that so far we've had well over 50 pledges for the Poppy Pendolino, meaning that at least £500 should be raised for the Royal British Legion. Currently at 75% towards the target. As some may be aware, the Kickstarter deadline passed, and although close, the target was not reached. One very interesting upshot of this whole project is the birth of a new company - Revolution Trains. Based on the experience of the Kickstarter method, this venture is designed to be a platform to put forward ideas for new models, gauge the market through a Kickstarter-type crowd-funding method, and then approach established manufacturers with a reasonable case for production as well as some of the funds for initial research and development. Hopefully this will result in some of the more niche products - usually shied away from by the UK manufacturers - becoming reality. Interesting, taking crowd funding into a revolving business model to gauge markets. Hope it works for them. If they have good ties with the manufacturers and can get some guarantees they will get stuff produced for a price then it should work well for all. Only hang is if they do a successful finance round and then production deal falls thru or there is a real problem in production for final price. The fan doesn't go down that road much. Great to see some creative attempts at doing niche products! The Virgin Pendolino 390? A crowd funded project? So who is the manufacturer? Which did you buy? Do you mind spilling the beans a bit? I'm all ears. I think Rapido trains made them.